Today I have a 5-string Music Man Stingray bass in for a partial refret and a new battery box. 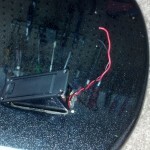 The wires have been broken off and re-soldered several times to where the plastic won’t hold the battery leads anymore. 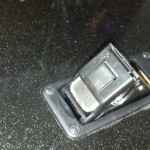 Also the plastic is broken off around the mounting screw holes. Time to swap out for a new one. The Gotoh single 9V battery box is an exact replacement for this Music Man bass. 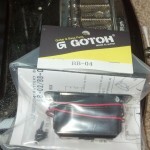 Music Man uses Gotoh battery boxes so I know this one will fit perfectly. First I remove the old battery box and the wires going to the jack. 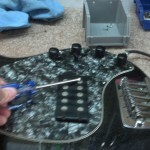 Then I feed the wires from the new box through the cavity into the control cavity. Before I screw it down I make sure the wires and arched up towards the top of the battery box. 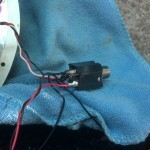 This keeps the wires from bending back and forth at the solder joint every time you change the battery. This is why the wires kept breaking on the old box. 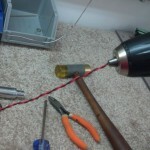 After I pull the wires through I twist them using the chuck of my drill. It spins the wires up nice and easy. Now I can solder the red and black wires to the jack. 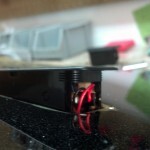 I simply soldered the red and black wires to the same lugs on the input jack as the old red and black wires. Red is positive and black is negative. Time to put everything back together and install a new 9V battery. I pop the lid on the box and install the new 9V battery. 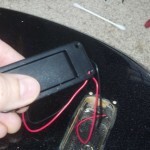 Lastly I plug the bass into my amplifier and check the signal by gently tapping the polepieces of the pickup with a screwdriver. A quick shot of some contact cleaner in the pots, jack, and switch to clean up any scratchyness and everything is as good as new. Thanks for looking. Stay tuned for more useful knowledge and tips!